Tooth replacement methods have traditionally only restored the parts of teeth that are visible above the gum line, but without the replacement of the underlying root structures, these tooth replacement options don’t offer the most natural and effective solution. That’s why we recommend dental implant supported tooth replacement for our Allentown patients. 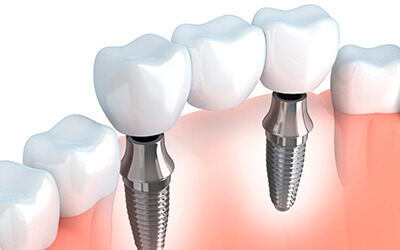 Dental implants are titanium posts that mimic root structures and support any tooth replacement prosthetic from a single dental crown to a full denture. Contact our team to find out more or schedule your dental implant consultation today. The dental implant process is completed in two stages. During the first stage, dental implants are surgically placed below the gum line. Dr. Lorri Tomko partners with a local specialist for this portion of the treatment process to ensure patients receive the best possible care. The implant placement procedure is relatively simple. A small incision is made in the gums, and the titanium implant post is inserted. A protective cover is placed on top of the implant, and over the course of three to six months, the implant post bonds with the supportive gum and bone tissue mimicking natural root structure. Once the implant site has healed and the implant is fused with the jawbone, patients visit Tomko Dental Associates where we attach a replacement tooth or teeth. Patients with one to four consecutive missing teeth, will likely need an implant-retained crown or bridge. To replace a single tooth, a dental crown is attached to an implant post. Two consecutive teeth can typically be replaced by attaching two crowns together to a single implant. Three or four consecutive teeth are restored with a dental implant on each end of a fixed bridge. Patients with more extensive tooth loss may need to consider an implant-retained partial or full denture. Partial dentures replace any number of consecutive or nonconsecutive teeth. We place the fewest dental implants possible to provide optimal support with a minimally invasive procedure. Full dentures can typically be anchored to between four and six implant posts. 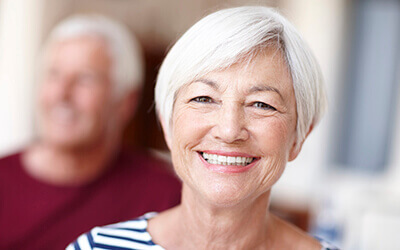 We offer both fixed and removable partial and full dentures depending on patient preference. In some cases, we may be able to refit existing dentures and attach the prosthetic to dental implants.